If you’ve been looking for Bison coolers for sale but thought about reading some Bison coolers review before making a final decision, you’ve come to the right place. In this post, we’ll have an in-depth look into Bison ice chest. 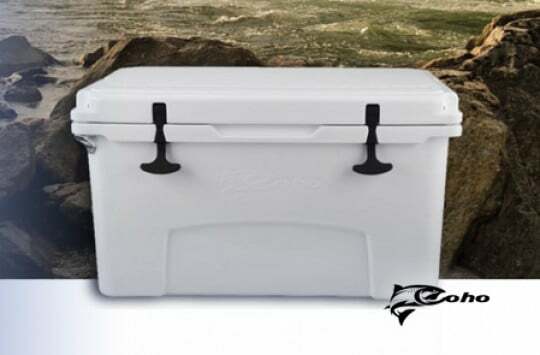 Bison Coolers (formerly known as Brute coolers of Brute Outdoors) is a 100% American owned and operated, down-home premium ice-chest manufacturer based out of Fort Worth, Texas. 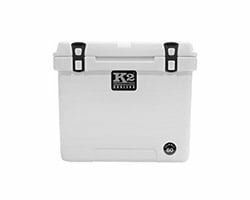 Their coolers are designed and constructed to be directly comparable to other leading manufacturers on the market (Yeti coolers, K2, Grizzly, Orca, etc). Their goal from the beginning was to provide customers with an American crafted, top-of-the-line product at a much more manageable price tag than the competition’s. 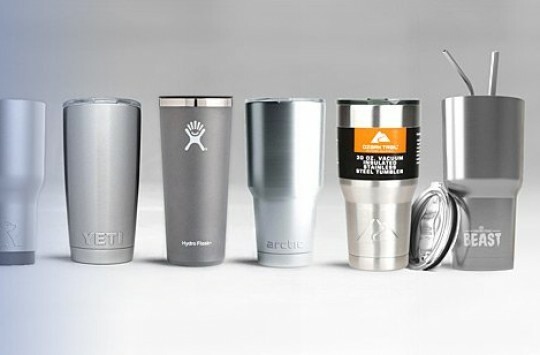 The brand Brute Outdoors began producing premium-quality coolers in 2011, and quickly gained a small but loyal following amongst the south Texas hunting/fishing/outdoors crowd. Due to the small size of the company, they didn’t manufacture a large volume of product. For example, you couldn’t walk into a West Marine or big box sports store and find Brute Coolers for sale. However, the product they did manufacture sold out quickly, and earned rave reviews across the board. They continued this small-time business model for several years, producing several models/sizes of fine, premium-quality coolers. Then in 2015, they somewhat abruptly announced they were changing their name to Bison Coolers, due to a ‘legal trademark issue’. 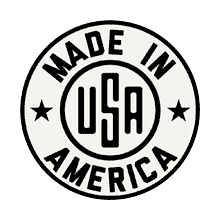 They made it very clear to customers that they were still the same American owned and operated company, and would be producing the exact same top-quality products, albeit with a different name*. Since then, things seem to have gone very well for Bison. They’ve even launched their own store on Amazon and their 100% American made coolers, both hard and soft ones, earned a lot of five-star ratings (e.g. here). (* Check out this article for the company’s complete statement on the name switch from Brute to Bison). 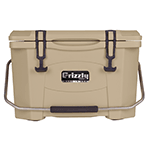 There are currently five different sizes of Bison coolers for sale and available in their Amazon store: 25, 50, 75, 100, and 150-quart. 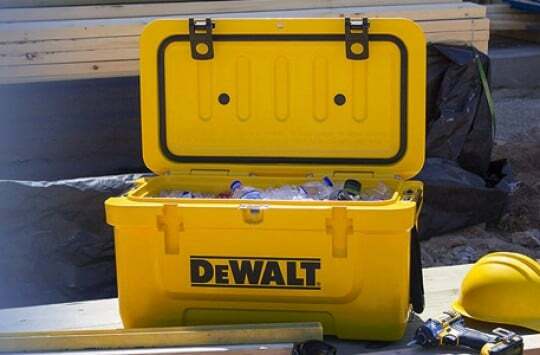 Each size cooler is roto-molded and constructed with maximum durability in mind. Keep in mind, this is a company built by hunters and fisherman, so they knew exactly the kind of product they wanted when they began the design/manufacturing process for the original Brute ice chests. They are specifically built to withstand the most brutal conditions that you or the outdoors can manage to throw at them – if you’re not using and abusing them, you’re not getting your money’s worth. 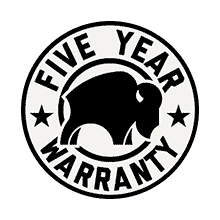 In fact, the company is so sure of the quality of their products that they offer a 5-year money back guarantee on every Bison cooler (2-year warranty for their soft packs). 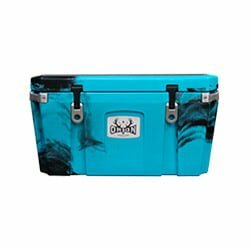 Bison coolers actually have some pretty cool features that are unique to the Bison brand. As we mentioned earlier, all Bison ice chests are roto-molded, which make us sure, they are high-end products with maximum durability. Tip: More high-end rotomolded coolers like Bison can be found here. 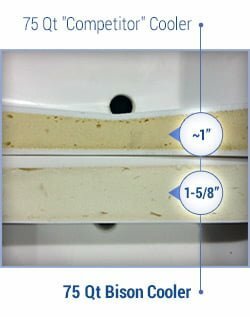 They have their own, proprietary polyurethane foam insulation material that they came up with to specifically try and outdo the competition when it came to ice retention. How well does it work? It will match any other top-brand cooler on the market size for size when it comes to keeping ice, and flat-out out perform a lot of them. We’ve got a full inch more than there’s in some spots. 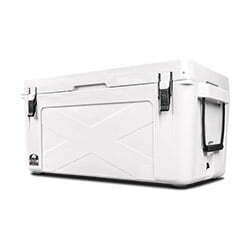 On average, expect a Bison cooler to hold ice easily for 5 days, even in vicious summertime conditions. Out of direct sunlight or if temperatures are a bit cooler, ice will keep easily for a week or more. To maximize ice retention you can also use blocks of ice. Another tip is to use ice packs, either the Bison ice packs or any other good performing ice packs. 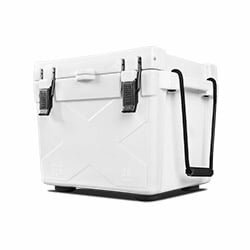 Another feature that we love about these coolers, and that’s unique to the Bison brand, is their cantilever design lid latches. These things are tested at a breaking point of over 170-pounds of force, which is well beyond the force required to form a good seal between the lid and cooler. The advantage of the latches being built well-beyond their intended usage is that they won’t break down over time. A lot of other top-brands, we’ve noticed, their parts tend to wear out over time, and the performance of the cooler is drastically diminished. 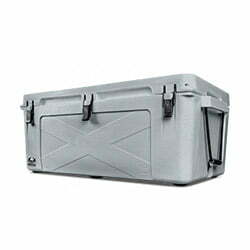 Additionally, the flush-mount hinge system on Bison coolers is bomb-proof. They’re constructed with a single piece aluminum rod that spans the entire body of the cooler, so you don’t ever have to worry about it failing. Bison Coolers is a brand that doesn’t forget where they come from, or what they’re about. Because of this, they offer 11 different high-quality vinyl lid decals that you can purchase separately to customize your cooler, whatever size you choose. Some of the decals support the people who helped build the company into what it is today, like TexasBowHunter.com and the Ford Raptor Forum. They also offer the Texas and American flags, as well as several other camouflage/outdoors type graphics. There are also a range of accessories available for the coolers, including high-quality seat cushions that attach firmly to the lid, a non-skid traction pad for the lid, a super heavy-duty rolling cart with off-road wheels, a removable dry goods tray, and a few different kinds of premium-quality straps to keep the cooler secured to your boat or pick-up truck. Bison Soft Sided Cooler, Anyone? If you’re into active hunting, spinning fishing or say, hiking, then you might not want to carry a 70 QT hard ice chest with you when going out into the wild. But drinks taste better when cold, right? In such case, what you need is a soft cooler. We’ve covered some of them in one of our previous posts, but it’s just recently when then Bison soft coolers caught our attention. And it’s not only because of their superb performance and a fact they’re advertised as the only soft sided cooler that’s actually made in US. What we love is their design. They look stunning. Stylish, classy. You name it. And they’re UV protected, so you can expect them look like new after couple of trips – they won’t fade easily. But don’t let the stylish design fool you, these are true heavy duty beasts, and user reviews on Amazon tend to confirm it. Bison claims their soft sided beauties will keep ice for as long as 24 hours in 120 degree heat. How come, you ask? One inch of insulation (up to twice as much as in most competitive products), made of 1000 denier vinyl shell, tear resistant up to 375 pounds – that’s how. They come in two sizes, holding 12 and 24 cans, respectively. Or, if you prefer to keep bags filled with ice, that translates to around 5 pounds of ice for the smaller and 10 pounds for the larger one. There is four colors available including a rare, stylish and very feminine pink. We’ll be sure to follow up with a more detailed bison soft cooler review soon. 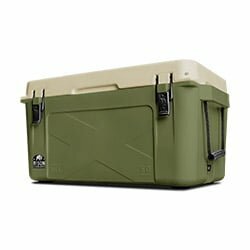 Bison Coolers for Sale: Where to Buy? 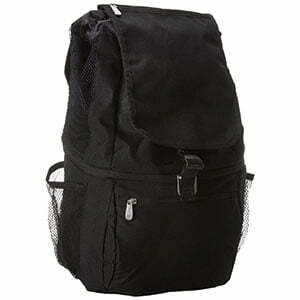 Wondering where to buy Bison coolers? Like we mentioned, every accessory, as well as each size and model, can be picked up directly through the official Bison store on Amazon. As a matter of fact, this is the only place (other than at their own website), that we recommend purchasing one. They actually have a disclaimer on their site warning against buying any Brute or Bison brand cooler/ice chest on eBay, Overstock, or any other online retailer, and warn that all warranties are voided if purchased through an unaffiliated third party site such as one of these. The bottom line of this Bison coolers review is that it’s really hard not to love their coolers and ice chests. We love what they’re about, where they come from, and – most importantly – we love how they perform. If you want a stylish and excellent-performing cooler that makes a statement about who you are and what you’re about, seriously consider a Bison. If the aesthetic isn’t enough to draw you in, their prices should be – easily a good 20% less expensive size-for-size than other premium quality competing brands.